AUTHOR INFORMATION: Andy Remic is a British author who lives in Manchester, UK. He used to teach English however now is writing full-time. He has a variety of interests such as sword fighting, climbing, mountain biking and kick-boxing. He is also an amateur filmmaker who loves to dabble in short films. He also helped develop a videogame based on one of his earlier titles. PLOT SUMMARY: In Kell’s Legend, the Albino army led by General Grall invaded from the north, and the city fell. Kell, Saark & a couple of others barely escaped with their lives. It is a time of brutality it is a time for warriors, a time for heroes. Kell is not a hero and even though Kell’s axe howls out for blood. Kell has to be circumspect, he is being hunted. The vampires are fighting back against him, and the mighty hero finds himself the prey of two beautiful but deadly vampire assassins. The SOUL STEALERS! Their bronze fangs are coming for him. With the life of his grand-daughter Nienna at stake as well the Kingdom, can Kell overcome his brutal dark past or will he choose to embrace it and become the Dark Legend of the past! 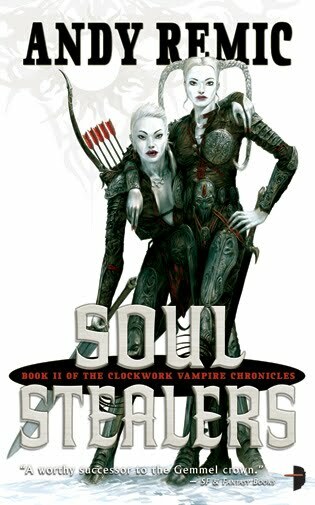 FORMAT/INFO: “Soul Stealers” stands at 309 pages divided over sixteen named chapters and a prologue. Narration is in the third person via several characters including Kell, Saark, Nienna, Anukis, Graal, Jageraw, Myriam, Queen Alloria etc. 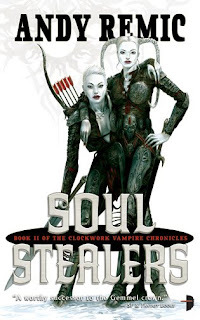 “Soul Stealers” is the sequel to “Kell’s Legend” and is a continuation of the story. The overall plot arc will end with “Vampire Warlords" the 3rd book in The Clockwork Vampire trilogy. OVERVIEW/ANALYSIS: Soul Stealers is the sequel to Andy Remic’s first fantasy foray and it offers more of what we got in the first book; lots of gory action and snappy dialogue. While “Kell’s Legend” had a pretty linear plot, Soul Stealers takes those plot elements and turns them sideways. The novel begins with the predicament that Kell and Saark found themselves in. They find out that the place where they are facing the Cankers has something even more deadly. The duo get a entity with its own agenda to join them, while they soldier on towards the Black Pike Mountains as per the events of the last book. Different things seem to be occurring with the Invaders. General Graal turns out to be his own man and sends out a pair - the titular characters - to hunt Kell. With this move and some others, Graal seems to be intent on heralding his own machinations circumventing the plans of the Vachine royalty. On another front Anukis reaches her nadir and discovers that there is more strength in her than even she knew. She journeys on towards a place of legends in search of her father and in the process discovers that she might be something entirely different than anyone could ever think. In captivity, Nienna learns there are different sides to her captors and the anger she feels might not be entirely misplaced. Thus with such a jumbled up cast and a rapidly twisting storyline, Andy Remic once again dips the readers in to the world of Kell. The ride is a bit bumpy as the story rapidly shifts from the first book's linear plot and newer sub-plots are inserted, while the background of the story is widened considerably. Andy Remic has to be given credit for his unflinching style which is certainly not for everyone. The action and gore levels are increased , while the characters are all tested and reveal more about themselves. Saark and Graal are both given major roles in this book. Especially Saark whose reason of his treachery is revealed. Andy Remic further inserts his trademark tropes in the story as there are intricate and multiple action sequences throughout the book. People who are looking for a long drawn out series with hidden meanings will be disappointed. Andy Remic has said that this book/series was about “a big f***-off Axeman with a big f***-off axe”. This is essentially what the series is about: Kell the Axeman’s saga. You get what is written in the plot synopsis along with a few nasty twists. My single major complaint with the novel is the twist in the ending. When I read it, I was immediately confused and wondered if I have missed something in this book or in Kell’s Legend. However by checking with earlier sections, the ending comes out as a very twisted thing with no explanations. I’ll give the author the benefit of doubt as it looks like this plot discrepancy will be addressed and most likely explained in Vampire Warlords. Overall, Soul Stealers is a better book than Kell’s Legend in the sense that it takes the same formula employed in Kell's Legend and then overrides it to give us a hyper-fast story with multiple twists and mayhem. The action and snappy dialogue are all here. This book delivers exactly what its predecessor promised: the ability to bewitch the reader and to turn your expectations upside down. Kell's Legend is one the few books that I have stopped reading. I wasn't liking it, though I plan on retrying once again at some point. But at the moment I'm not feeling this series. Its a 50-50 book, either you like it or you don't. I think its like that with A. Remic's books. I somehow don't get his Spiral books but this fantasy series was a fun read for me. If you didn't like KL then SS is more of the same but considerably amped up so you can give it a go & try it later.